Smart-Illumination automatically adjusts from day to night mode. shows precise, easy-to-read bearings superimposed on the edge of the viewing image, plus a reticle for calculating distance to an object. Smart-Illumination display automatically adjusts to ambient light from day mode to night mode. 96% light transmission due to Steiner's unique maritime lens coating formula that reduces glare, increases clarity and maximizes optimal viewing in hazy light or after dark. Commander Global 7x50 is rated 5.0 out of 5 by 3. 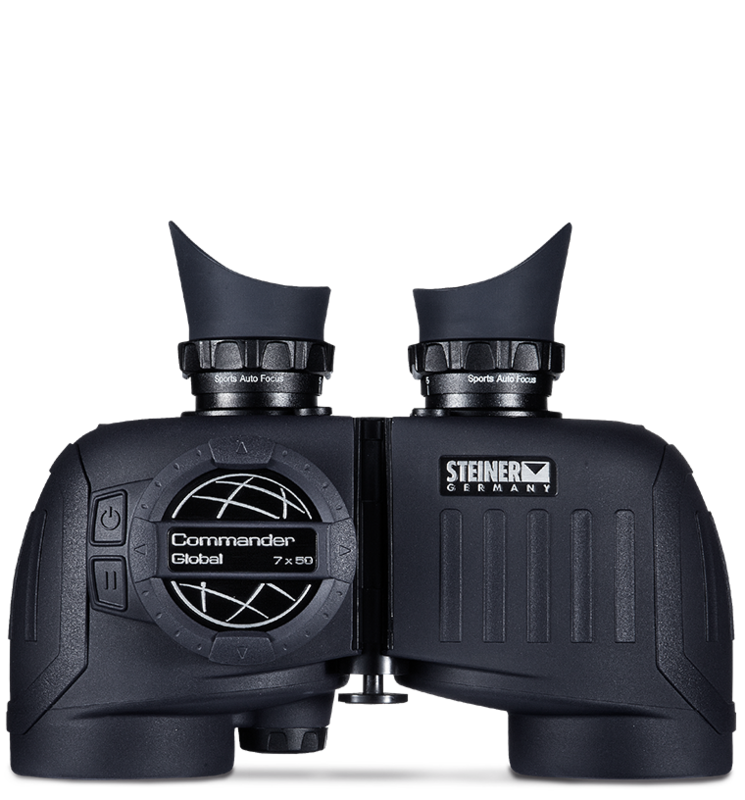 Rated 5 out of 5 by Neszy from Steiner - Commander Global C7x50 I just received this product today. I have yet to taker it to work with me (Beach lifeguard). I have fiddles with it a bit and my first impressions are that it's very sturdy and looks/feels like an amazing pair of binoculars. I have heard great things about Steiner customer service and I can't wait to take them out on the ocean and break them in. Rated 5 out of 5 by Mark at Sea from Tremendous Product; Fabulous Service My philosophy is to use the best gear I can afford, especially in activities where they may be some element of risk, and I encourage that approach with others. I've had my Commanders for about 30 years (Made in WEST Germany!). They have been used heavily both on land and at sea, and have held up very well. They are obviously rugged and durable. The optics are exemplary, especially in low-light conditions, the graticule is great for rangefinding and the compass/light is accurate and easy to use. I have been extremely satisfied with their performance. Here's the kicker. Steiner has an excellent service program. I finally decided to send them in to have the compass/light serviced, thinking that's all they needed. They made it easy to return the unit, kept me apprised of the progress and did far more work cleaning, polishing, replacing and upgrading various parts, and were very responsive to follow-up questions. They were a pleasure to work with. Rated 5 out of 5 by The Navigator from Superior Optics - Great Upgrade Sent in my 18 year old Commander Digital Compass binoculars to see if they could be salvaged - unfortunately no (sad). Steiner offered to replace or credit via the Heritage Warranty to upgrade - so I upgraded. Commander Global is AWESOME ! Hello, any idea when the follow up for the&nbsp;Steiner Commander Global 7x50 with compass will be announced since it's already 4 years on the marked. Thx for informing me. There are no plans on a new model of Commander Global binoculars. Commmander 7x50c - do i understand correctly from one of the posts the compass only works in the USA? ?, or may NOT work as well elsewhere? All analog compass-equipped models sold in the US will have the Zone 2 compass installed, the Zone 2 compass works within the latitudes covering the US, Europe, southern Russia/Turkey, and northern China. The compass will function outside these latitudes, but its utility will be hampered by the balance of the compass needle - depending on where you are outside the established zone, one end of the needle will dip, and may not turn freely, resulting in inaccurate readings. I have a pair of Commander II Electronic. &nbsp;They have given me several years of good service but the compass function no longer works. &nbsp;I had sent my previous Steiners to Pioneer Research who did a spectacular refit service. Who can now do this service? Does the Steiner Global Commander come with a wooden presentation box? The 750C has a compass. Could you explain about difference between Commander and Commander Global? This is for my son's present, who is navigator and celebration of 20years old. Hello! For detailed comparisons, please use our comparison tool on the product page.